"Giggle Wiggle" is a fun yet surprisingly challenging game for young children. Goliath Games is a company that is known for producing some of the most fun and unique playthings on the market. At the 2019 Toy Fair in New York City, the company unveiled their plans for a fun-filled 2019 courtesy of many exciting new games. Although most of their new products are slated for release this fall, they did release some hot new items just in time for spring. Here we have highlighted some exciting titles that are great for the spring season! “Giggle Wiggle” is a fun yet surprisingly challenging game for young children. Giggle Wiggle—Intended for two to four players aged four and up, Giggle Wiggle is a game that has a tall plastic caterpillar-shaped apparatus at its center. The cute caterpillar has many hands and feet with grooves to hold marvels. 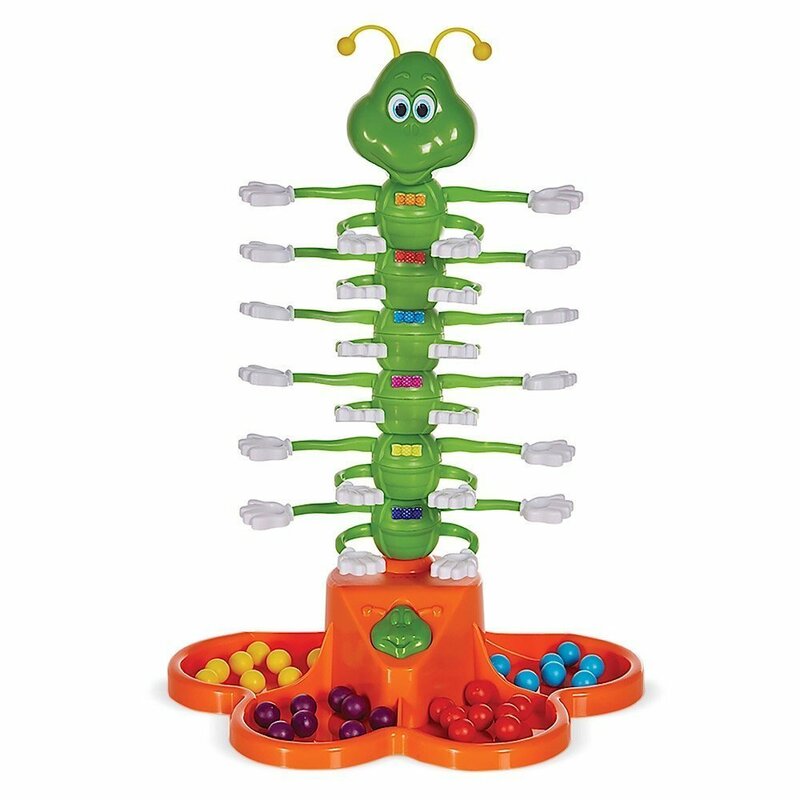 Players must race to place their colored marbles (either red, blue, purple, or yellow) from the bottom row of hands all the way to the top…which is hard to do as the caterpillar wiggles and dances to catchy music. Giggle the Caterpillar will try to knock off your marbles! If he does, just pick them up and keep racing. Giggle Wiggle essentially a new twist on the classic “race-to-the-top” play pattern! It’s cute, fun, and easy to dance along with. It retails for $10. “Jumping Jack” is a perfect Easter basket gift. Jumping Jack—The perfect Easter present, “Jumping Jack” is intended for two to four players aged four and up. The game requires players to spin spinner to see how many carrots you get to pick from Jack’s bunny hill. One of the carrots will make Jack jump, but it’s a different carrot every time. If he jumps on your turn, you’ll win if you catch him. Or, extra rules let every player try to catch him when he jumps. If no one catches Jack, then the player with the most carrots wins. On the flip side, if Jack “jumps,” the person to make him jump can be regarded as the loser, and the winner is the remaining player with the most carrots. The game can also be played solo, by simply trying to select the “trigger” carrot last without using the spinner. This delightful preschool game teaches hand-eye coordination, taking turns and quick reactions. It also has many ways to play and will proves endlessly amusing. It retails for $19.99. “Color Slap!” is a fun and unique card game that can be enjoyed by a wide range of ages. 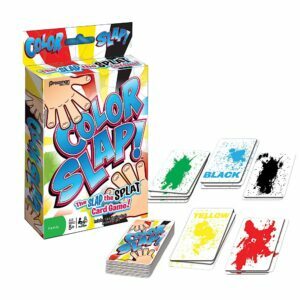 Color Slap!—In this fun and original card game players can “slap” their way to victory in this test of color coordination and fast reflexes. Players take turns placing cards face up in a pile. Whenever a card showing a splat with matching text is flipped, players must race to “Slap the Splat” and win the pile! Some splat cards have text and some do not, which further complicates matters. Whoever gets the most cards wins! This game is best for two to six players who are ages five or older. It retails for $15. “Charades for Kids” introduces young people to the classic game. 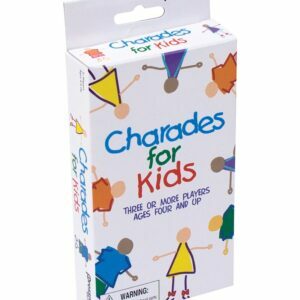 Charades for Kids—Intended for children ages four and older with at least three players, “Charades for Kids” is essentially the classic game of Charades which had been designed especially for kids to play and enjoy! With three levels of clues, each card has one pictured clue, so no reading is required (although the combination of the picture and its corresponding word reinforces early reading skills). Younger players can act out a toothbrush, a cat or a bumblebee. Older children can read the simple words and phrases and act out actions like eating spaghetti or playing guitar! It’s great fun for the whole family as they try to guess the charade before time runs out! This version of the game features many imaginative cards and is a great way to introduce young children to this timeless game. It retails for $9.99. To learn more, visit the official Goliath-Pressman website.